The time before the symptoms of a viral infection appear is called the incubation period. During this time, viral genomes are replicating and the host is responding, producing cytokines such as interferon that can have global effects, leading to the classical symptoms of an acute infection (e.g., fever, malaise, aches, pains, and nausea). These symptoms are called the prodrome, to distinguish them from those characteristic of infection (e.g. paralysis for poliovirus, hemorrhagic fever for Ebolaviruses, rash for measles virus). Whether or not an infected person is contagious (i.e. is shedding virus) during the incubation period depends on the virus. For example, Ebola virus infected patients do not pass the virus on to others during the incubation period. This fact explains why Tom Frieden said there was ‘zero chance’ that the passenger from Liberia who was diagnosed with Ebola virus infection in Dallas would have infected others while on an airplane. He had no symptoms of infection because he was still in the incubation period of the disease. In contrast to Ebolaviruses, poliovirus and norovirus are shed during the incubation period – in the feces, where they can infect others. Remarkably, viral incubation periods can vary from 1 or 2 days to years (Table; click to magnify). Short incubation times usually indicate that actions at the primary site of infection produce the characteristic symptoms of the disease. Longer incubation times indicate that the host response, or the tissue damage required to reveal the symptoms of infection, take place away from the primary site of infection. The table was taken from the third edition of Principles of Virology. Missing from the table (which will be corrected in the next edition) is the incubation period of Ebola virus, which is 2 to 21 days. I would also argue that the incubation period of HIV is not 1-10 years, but 2-4 weeks, the time until the prodromal symptoms occur. The characteristic symptom of HIV-1 infection, immunosuppression, occurs much later. In biology nothing is ever black and white. I was surprised that Frieden said ‘zero chance’ instead of ‘low probability’ or some such word. However in animal models and in the limited number of humans studied, no virus is detected until symptoms arise. I will dig up the references at one point. When I make statements they are based on research, not speculation, unless otherwise indicated. However a blog is not a research paper, so not every statement is referenced. I think Frieden is doing the right thing in making strong statements, to balance hysteria. He made similarly strong statements about having no doubt that an epidemic in Dallas, if it occurred, would be contained. It’s risky to him, because if one of his predictions prove wrong it’ll cost him his job and some credibility, but such strength is reassuring to those who are inundated with hysterical media reports and scare-mongering by crackpots like Dr. Oz. You might want to revise the incubation period for HCV as well (i.e. to “15-150” days). In 2004 there was an outbreak in Maryland arising from a contaminated radiopharmaceutical, and the CDC prepared a report (Patel et al., JAMA 2006;296(16):2005-11; http://www.ncbi.nlm.nih.gov/pubmed/17062864). The incubation period in that outbreak was as short as 15 days (median 25 days, range 15-41 days, Table 1). The attack rate in this outbreak was 100% and may reflect the large, intravenous inoculum, as well as the older age (median 63, also in Table 1) of the victims compared with the young IDUs who constitute most of the epidemic here and worldwide. Whether these unusual features contributed to the short incubation period. I suspect his bold statement was a result of attempting to reach the intended audience. There is an issue of balancing the scientifically correct statement with the media-friendly 10 second sound bite. I agree that a phrase such as ‘incredibly low possibility’ would be more accurate, but those he was intending the message to be delivered to are unlikely to know the difference between a bacteria and virus. Perhaps a future blog post could look at the intricacies of research scientist communicating with the public during a health crisis? How do we balance accuracy with clarity? I am not convinced that ebola virus is not shedding during its incubation period. Maybe the trace amounts of virus are not high enough to be detected by our screening methods. This is a tenacious and mysterious virus, and I suspect shedding occurs even during incubation. I am thinking it would take a true scientific explanation to convince me. Historical descriptions of Ebola state that the onset of symptoms is very sudden and severe. However, it’s reported the Spanish nurse Teresa Romero experienced 5 days of low fever before her symptoms developed enough to be considered worth testing. Does this suggest that Ebola may be evolving a prodrome, and if so could it become infectious in this stage? Thomas Duncan had a temperature of 103 F during his first Emergency Department visit. It was only two days later that he was admitted and placed in isolation. How many people have become infected from those first days? None that have been announced, so far. Duncan arrived in Dallas on Sept 20, and was ill on Sept 24. His first ED visit was Sept 26, 17 days ago (most people present 5-8 days after exposure, and quarantine ends at 21 days). This is just one example among many – fear does not compete with data. Another possibility is that people with greater access to health care will get attention before their symptoms are severe. While we should be vigilant for real changes like the one you imagine, observations from different care settings often differ. I be looking this stuff up because I wonder a lot about it. Right now for example, I feel the common cold might have more variables and stuff involved, including the incubation period. 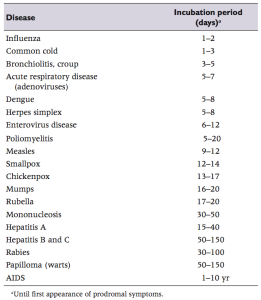 For example the chart lists 6-12 days for enterovirus, and 1-3 days for common cold. What about Enterovirus Colds? I will say, I got a severe cold this september about 14 days after camping with a friend who developed a severe cold during the trip……. There are always going to be outliers, incubation periods that go outside what we write in a textbook. They are meant to be guidelines. Biology is never black and white. At the beginning of this thread, CRS-DrPH wondered about the statement of no virus shedding during the Ebola virus incubation period. After having looked at the literature, one has to be careful, as it’s based on epidemiological observations, not experimental ones. The fact that no one, apparently, has been observed to contract Ebolavirus infection unless they have been near someone with symptoms. But as someone says below, if levels of virus shedding are low, transmission might not be apparent epidemiologically. I’d much rather have laboratory data. does anyone have the data on the incubation period on Ebola rising to 40+ days? I am a hospital epidemiology and infectious disease consultant guiding hospital and public health in my region, currently for Ebola. In searching for scholarly support of the cited incubation period and viral infectivity during that period, I have not been able to find any primary source document that actually looks at measuring viremia and infectivity during the the period of incubation, even in an individual, let alone a cohort of potentially exposed humans. Based on what I have found, it appears we actually do not know when viremia or viral shedding in different body fluids begins, and if this overlaps with the clinically silent (asymptomatic) incubation period. Noted is the excellent review posted by IDSA and Oxford online by J. ter Meulen on Filoviruses which mentions cases of asymptomatic Ebola infection in passing. This implies there are patients who have asymptomatic viremia, survive and become immune, which implies viremia occurs in the incubation period. Notable, also, is ter Meulen recommendation for negative pressure isolation and protective garb in handling the virus. There are a number of sources that cite measurements of viral RNA or plaque counts on day zero of active disease, the time when CDC and other state that infectivity and transmission can be begin. All of these cite viremia in the range of 50,000 to 10 million RNA copies per cc. If viremia is this high at the onset of clinical disease, then surely, there must be significant viremia and likely viral shedding from other fluids before this time during the incubation period. See J. Virol.April 2004 vol.78 no. 8 4330-4341 for one example. CDCs statement that humans are not contagious during the incubation period is an equivocation of terms, hopefully not on purpose. It is highly likely based on current scientific evidence that viremia is present in the late stages of asymptomatic incubation and body fluids are probably infectious proportional to their viral content during that time, a phenomenon that has not been studied and published. E.g., blood transfusion from such an asymptomatic donor incubating Ebola would likely be lethal to the recipient. Fortunately, asymptomatic but incubating Ebola infected patients are usually still continent of their body fluids and blood, and thus, by virtue of this, not contagious. This accounts for CDCs statement to the public I believe. But to say that the incubating patients body fluids is free from infectious virus is not substantiated by the evidence, either positively or negatively as best I can find. Please correct me if I am wrong, but I cannot find any evidence of viral measurement during the incubation period of individuals infected but still asymptomatic. Thanks for this post. It’s clear that more and better data is needed and that so much of what we “know” may be wrong. Perhaps because of this particular population of virus or perhaps because of too many assumptions. Many of these studies are behind paywalls, but these kinds of research depend on collecting information by interviewing people. As such, we can expect the kind of error/accuracy in social science rather than experimental science. We desperately need more data from more carefully controlled data collection like those from Nigeria where incubation was as long as 24 days. so basically what you are saying, is that, their is no way of effectively testing for the Ebola virus before symptoms show? I did not say, and don’t believe, he’s lying. Your sarcasm is misplaced. What is your opinion on this earlier piece (Acute Viral Infections link below). It appears to indicate that transmission from an asymptomatic ebola carrier could infect via droplets, i.e., cough/sneeze. The CDC just changed the guidelines on that now saying up to six feet if droplets get in the nose, etc. I keep reading that coughing/sneezing aren’t “usually” symptoms of Zaire ebola, but the usually reminds me of a Caveat Emptor. Thanks. What is the contagion period? The nurse used an exposed thermometer on me and so far 16 days passed without me showing any symptoms besides my usual anxiety the best you can do is take a list of vaccines that you got along with the number of doses taken and take it to the doctor tell him to test your blood for possible and deadly infections only that’s to reduce the price of the blood test personally I wouldn’t mind a cold so I wouldn’t test for that and the flu would jave showed up 10 days earlier so that’s not required either.